Gene Mallory, as he was known to his family and friends, a native of Mineola, Texas was born May 2, 1925 and died August 26, 2014. Both of his parents died when he was a child and he was raised by his grandmother, Lula Little, and his Aunt Ruth. Immediately after graduation from high school he enrolled at Southern Methodist University but World War Two interrupted his school studies and he enlisted in the Army Air Corps and served in the Central European Theatre. When discharged, Gene again enrolled at SMU and in 1948 received his degree in business. He was a member of the Reserves and got called back to service during the Korean War. After this service, Gene returned to Mineola and took a job with Benham & Company where he became Secretary-Treasurer. In 1958 he was appointed as the Mineola Postmaster where he served four years and then returned to Benham and Company where he remained until 1985 when he retired. Gene was the husband Lou Mallory a long-time member of the Wood County Texas Genealogical Society (WCGSTX). After his return to Mineola Gene became very involved in community affairs and served as Secretary of the Mineola Memorial Library Board, president of the Tyler Camellia Society, secretary of the Mineola Heritage Association, member of the Mineola Historical Museum Board, secretary of the Mineola Rotary Club for many years, secretary of the Mineola Country Club, Republican County Chairman, and a member of the Mineola Zoning Board. He was one of the very early members of St. Dunstan’s Episcopal Church where he served as Junior Warden, and also taught a Sunday School class. Gene was preceded in death by his son, Bill Mallory, and is survived by his wife, Lou Mallory, and their daughter, Mary Mallory. Burial was in Cedars Memorial Cemetery, Mineola. He was well-known in his home community, greater Wood County, and the East Texas area. He and Lou have many friends in the WCGSTX and the area. 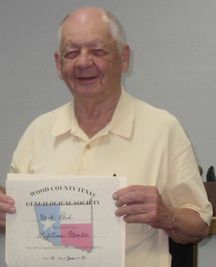 Mark Reid, former president of the Wood County Texas Genealogical Society (WCGSTX), died August 29, 2014 at Mineola, Texas. He was born on November 24, 1929 in Birmingham, Alabama. A long-time WCGSTX member, Mark was honored in 2012 with a Lifetime Member award. He had served the society as president, vice-president, webmaster of the TXGenWeb Wood County webpage and was a frequent contributor of articles and answered queries in the WCGSTX newsletter. He served in the U.S. Air Force from 1950-1954 and was an active member of the American Legion. Mark received bachelor and master degress from Southern Methodist University. He retired from E-Systems in 1989 after working there for 28 years. He was also a member of the Lake Country Bible Church in Mineola. He is survived by his wife, Lois; daughter, April Hadley and husband, Rick of Houston; daughter, Melanie Dorociak and husband, Barry of Garland; grandchildren, Erin Bush and husband, Brian, Sarah Hadley, Brittney White, and Andrew Hadley and wife, Annie. Mark was a respected and beloved member of this society and will be missed by all who had the opportunity to know him. Thanks for the help at the Mineola Memorial Library stop on the 2013 Wood County, Texas Genealogy Road Show to the following society members who braved the weather to be present: Mark Reid, Shirley Bates, Angela Low, Mary Ann Neiswanger, Shirley Patrick, and Deason Hunt. Welcome to the following new members who have recently joined the Wood County, Texas Genealogical Society: Angela and Jerry Low, Robert & Mary Kae Mausharat, and Art Simmons. An updated WCGSTX membership roster has been posted on the Members Only page which you can access at the top right link on this page. Please check to see if you are on the roster if you have paid your 2012-13 membership fee. If not, contact Secretary and membership Chairperson, Shirley Patrick at shp1945@gmail.com. We will shortly be notifying members with email access of the new password, but the old password will work until you are so notified. The regular January 21st meeting of the Wood County, Texas Genealogical Society will include presentations about the Alba, Golden, and Rhoads communities starting at 7 p.m. at the Shamburger Room of the Quitman Public Library. The public is invited. The spring road show to area libraries will also be discussed. 6:00 p.m. — Time to offer or seek help with genealogy for members and the general public and/or to go online and search databases. We meet at the Quitman Public Library. Christmas Party Dec. 17 at 6 p.m. The Wood County Genealogical Society will hold its annual Christmas party on the regular meeting night, Monday December 17, at 6 p.m. at the Shamburger Room at the Quitman Public Library. We are hoping for a large turn out from all out members who live close enough to drive in for the party. We would love to share this time with you and your spouse or other guests. There will not be a 5:30 p.m. gathering at Peralta’s that evening. Members are reminded to bring finger foods to share with others. Plates, cups, napkins, ice, etc. will be furnished but you should bring your choice of drink. Important: If you know local area members who do not get email or check the internet, please call them and let them know about the Christmas party.